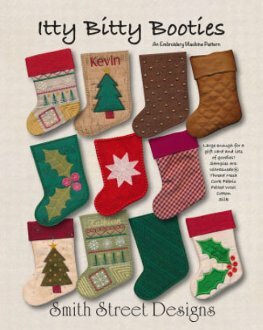 A cool dozen mini stockings to make on your embroidery machine. Six designs are for heavier non-fraying fabrics like felted wool, cork fabric, and kraft-tex, and finish in the hoop. Six designs are for lighter, woven fabrics like cotton, silk, and ultra suede, and finish with a bit of machine sewing.